Knowing that some day all my hard-gotten skills and knowledge will make me live a rich and lively life has been an additional daily silent motivation. It's better to spend one's youth building a formidable career or business than looking for easy money. Money cannot get you skill but skill can get you money. Being the son of a billionaire can get you a car the mechanic's son can only dream of but to become a skilled driver you will have to learn like the mechanic's son. In fact, he has an edge over you skill-wise. And it's like that for all skills and valuable experience, they come with invested time and hard work. Money can't take the place of that hard work and invested time. There is a confidence and ease that comes with knowing you are extremely good at what you do and you control your source of income. And this confidence can only come from years of hard-work learning and perfecting your work skill. Saying no to many quick money options and spending money you could have saved on learning to be the best. You prioritize learning over earning. Your client/boss knows how extremely valuable you are and treat you with respect. No financial setback can lead to a crisis because there will be companies willing to sack one of their staff just to create space for you. And if you decide to go on your own, it's not a matter of if you will get customers but when they will begin to troop in. 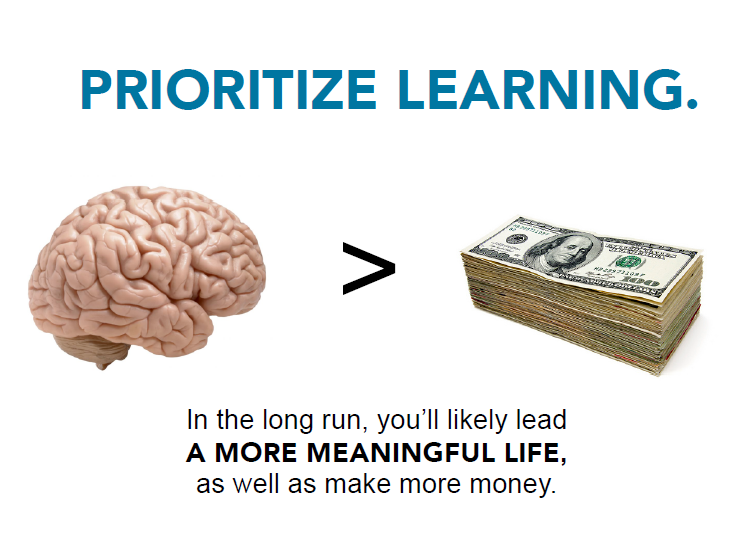 Prioritizing learning over earning makes you productively active and valuable. You create huge value in your field of expertise. And you move the nation's economy forward. The trick is to be focused and not dabble in and out of everything. Find out where your aspirations and values lie, chose a career/business path along that line and give it your best. Invest heavily, in time and resources, to become one of the best in your chosen career/business field. Keep at it and don't have an exit strategy; make it a lifelong plan. After a while your efforts and learning will set you apart. You will become a respectable authority in that field and money will come in amounts you never believed possible while you were struggling in the early learning stage but kept on. So for a live of relevance and financial stability, prioritize learning over earning.